- Ween, "Poop Ship Destroyer"
Pardon the juvenile humour off the top, but this journey has been so unreal that I can't help but fall back on laughing in the absence of appropriate things to say. 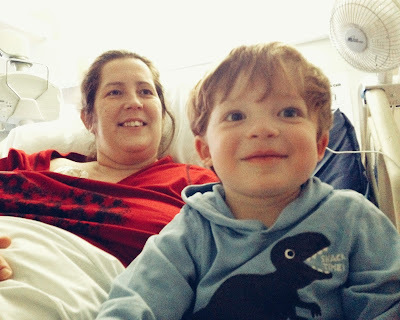 Amanda's headed for another big surgery this week. 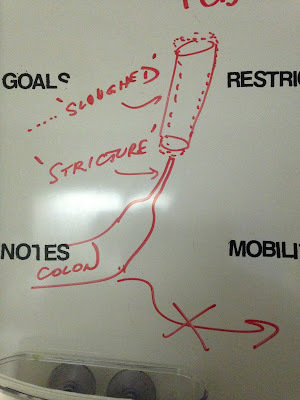 I see a tampon and a freaky condom, but this is a medically accurate drawing. The business end of the remaining colon sloughed its way back into her insides and strictured itself off, creating a cul-de-sac with no escape for poop nor gas. They put her on TPN (full nutrition by IV) but let her drink, trying to buy time until the gnarly mess of adhesions and young scar tissue inside settled down enough that they could go back inside and ... re-colostomitize. Yes, she's been in hospital the whole time. One week was the expected stay. Going on six weeks or more, now. I've lost count. So, I'm sure you're thinking -- hey, food or not, you're still making poop every day. Where was it all going? Mommy and Gordon take a walk. Great question. None of the answers I could provide would be anything less than disgusting and/or unbelievable. By the surgeon's account, the human body has ways of rerouting things that would make the designers of the Internet jealous. Meantime, the docs had Amanda on a vacuum-suction wound appliance. They packed her huge, gaping, sternum-to-pubis incision with what looks the grey acoustic foam on my studio walls, taped it all up airtight and applied 24/7 suction to it. It slurped out the healing juices from the wound. Very high-tech, and I'd never heard of it until I saw it. All good, until it started to stink. Like, open sewer kind of stink. Not a great volume of stink, but enough to make Amanda queasy and embarrassed. Heck, she was nauseated and fatigued most of the past week, made worse by odors she couldn't tell were real or ghosts. We found out this weekend that a) they were very real and b) holy poop, it was poop. Coming out of the wound. W....T.....F? Yes, it looks like her colon has popped another hole. Not only that, her abdominal wall must be compromised too, in order for the poop liquid to be sucked through the wound, the sponge, the vacuum, and into the tank. Hence, the order to get in there and fix things ASAP. Other than the complete lack of eating, recurrent nausea, disturbing stinks, a gaping wound that looks like linear steak cooked from raw to well done, and assorted symptoms that aren't my place to be talking about without her say-so, things have been appeared to be half-decent for the past couple of weeks. 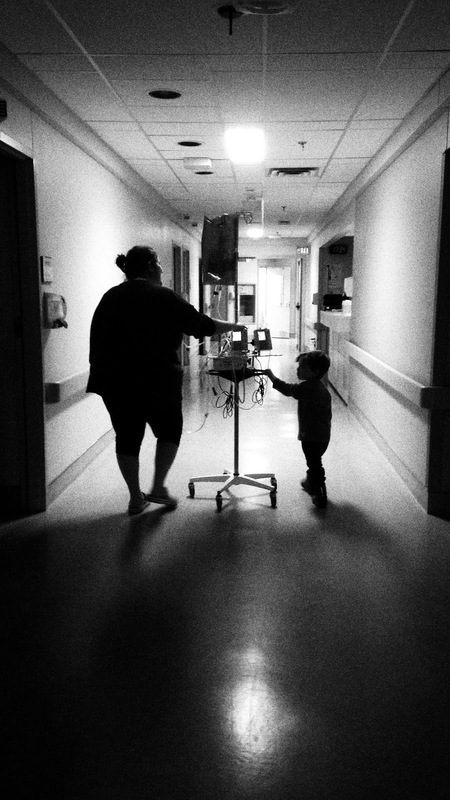 Amanda's been having some excellent visits with Gordon, including having him accompany her on walks through the hospital hallways. He loves to push the IV pole and "help" push the wheelchair when she needs it. He gets a huge kick out of riding the fancy bed up and down like a helicopter. She even came home for a few hours each day this past weekend, still attached to the vacuum unit. Seriously, this latest turn has me pretty disturbed. From what I understand about feces, it's not supposed to be outside the expected tubes. It's certainly not supposed to be on open wounds. Definitely not spread across open two-foot-long wounds and sucked through, 24/7. None of this seems like remotely OK news, frankly. The fact that Dr. Sugimoto is not pacing around and freaking out is what's got me grounded at this point -- if he's not panicking, I'm going to believe that he can fix this and get her back in order. Until the surgery happens, and it could happen as soon as Monday (tomorrow as I write this), the vacuum gadget is out of the picture and it's back to plain old pack-it-with-gauze, sorry-for-the-agony. Still ahead: the surgery. What colon will she have left? Where will they choose to route it to come out of her body? What are the health consequences of having had all this poop in unwelcome places? How long will it take to recover THIS time? When will Amanda be home? We're feeling DONE, but we ain't done yet. Not by a long shot. Amanda and Gordon, both still smiling. I'm amazed by her. And you. Bless you all. I wish so much I could help.